Hello. My name is Tracey and I’m the worst gardener ever. Welcome to my support group. I didn’t set out to be the world’s worst gardener; it was not because I didn’t have good intentions or a pure heart or unwillingness to give it “the old college try”. It’s not that I forgot to water or fertilize or get rid of caterpillars. I think it’s just good ole’ Murphy’s Law and really bad luck. So, I told you last week about the rats that invaded the garden less than 12 hours after I planted the fall/winter vegetables. We set traps, and for the first couple of days, they seemed to work. We caught three big, ugly rats and thought that our problem might be coming to an end. But, the rats kept coming and you know what? They are getting smarter! They are actively avoiding the traps. They don’t take the peanut butter that we set out as bait. They went after the most vulnerable plants in the garden and They Ate Everything. Remember all those seeds I planted ten days ago? Gone. All of the tender leaves stripped bare. To add insult to injury they even went so far as to dig the seeds out of the ground and they ate those, too. The tiny arugula? razed. Baby lettuces? disappeared like a phantasm. They stole the last few eggplants that were growing and ate those, too. There was almost nothing left except for the thyme and the basil, which they don’t seem to like. I consulted the internet and saw on a message board that rats can’t stand the smell of catnip. Apparently, a chemical in catnip, called trans-nepetalactone, smells a lot like female cat urine. 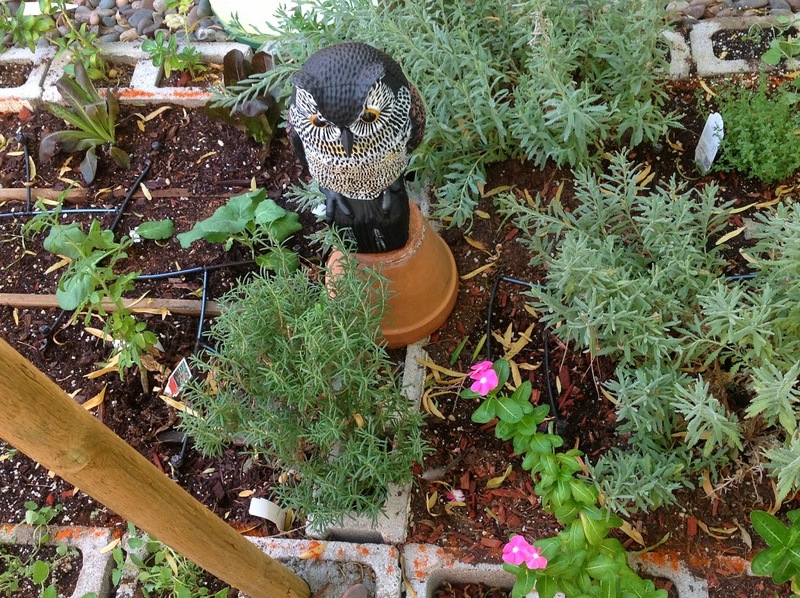 So, off I went to the nursery and picked up ten catnip plants and a big plastic owl. I planted the catnip in the holes of the cinderblocks. I had also gotten a tip from a new friend, Marilyn of Cowboy Trail Farm, who suggested cayenne pepper. I sprinkled that all around the edges of the garden bed. I felt like I was warding off demons or something (I suppose I am in a way)! So, I started over. I replanted all of the seeds. I bought a few more seedlings because now I’m ten days behind schedule for planting. And now we wait and see if any of this works. I’ll keep you posted! If any of you have any suggestions on how to deal with this problem, I’d sure appreciate it! P.S. I just thought of something: maybe the catnip will attract an army of alley-cats to my yard…. Problem solved!